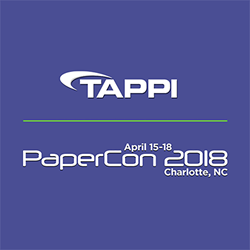 Michelman will introduce PaperCon 2018 attendees to its proven line of waterborne and environmentally responsible functional coating solutions. Their variety of compostable, recyclable and renewable coatings help brand owners increase sustainable practices that reduce waste and utilize fewer raw materials. Michelman’s functional coatings produce a multitude of barrier and functional properties that are critical to product protection and brand packaging. Attendees to the exhibition can also discuss how Michelman’s collaborative approach with the entire packaging value chain, including paper mills, converters and brand owners, accelerates the concept-to-commercialization cycle. Their innovations produce better and more sustainable packaging with improved product, print receptivity, digital printing, and heat seal protections. Michelman’s functional coatings produce a multitude of barrier and functional properties that are critical to product protection and brand packaging. Michelman’s well-known brands, including Michem® Coat 525, VaporCoat® 2200R and Hydraban® 430 will be featured at the show. These and other leading Michelman solutions are used as barriers to oxygen and oil migration, and for grease, oil, water, moisture and stain resistance. Michem Coat 525 is used primarily for its robust grease and oil resistant properties, as well as its water resistance, release, cold and hot melt gluability, and compliance with specific food contact regulations. VaporCoat 2200R provides water and grease resistance and excellent MVTR properties on kraft liner and other substrates. When properly applied over a base coat, this repulpable coating is recommended as a replacement for some curtain coating applications, poly-laminated board and plastic bags. Hydraban 430 is a waterborne dilutable coating that provides good water beading and water repellence to paper substrates and is cold set gluable with most adhesives. These and many other solutions can be discussed at Michelman’s booth #924. The event is being held April 15-18, 2018 at the Charlotte Convention Center in Charlotte, North Carolina.